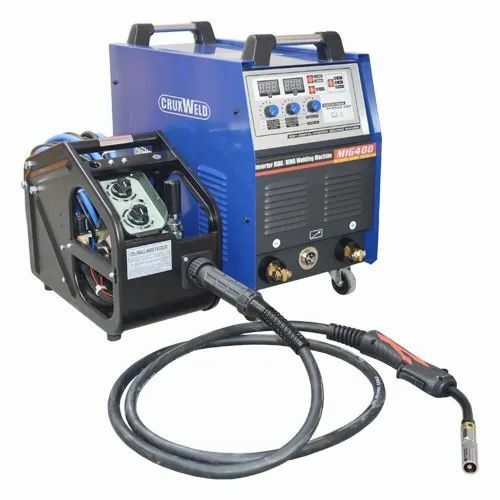 We offer an exclusive range of Inverter MIG/MAG (Co2) Welding Machine that are useful in fixings objects or mounting on any suitable surface. Established in the year 1997, at Faridabad (Haryana, India), we, “Cruxweld Industrial Equipments Pvt. Ltd.” an ISO 9001: 2008 Certified Company are listed as the most renowned Manufacturer, Distributor, Supplier & Exporter of a comprehensive assortment of Welding Machines & Cutting Machines. The offered range of products is manufactured using the best grade raw material and sophisticated technology in accordance with the set industry standards. Our offered products are highly acknowledged for their diverse attributes such as supreme quality, durability, fine finish, low maintenance, reliability, and optimum performance. Clients can avail the offered products from us at the most reasonable prices.